Here we take you through our process from start to finish. We would like to thank Andrew Nicoloau of “The Shoe Box” in Haslemere for his assistance, and for allowing us to use him and his machines as our example in this instance. Andrew was looking to open a new branch and replace his finisher, and having dealt with Standard before he immediately contacted our Sales Director Keith Malyon. Keith then visited Andrew to discuss machinery options and offer advice gleaned from 25 years as a shoe repairer as to the layout of the shop. The ideal machinery layout proved to be a bandscourer, press bench and finisher with a view to changing his current working practice in order to become a more efficient business. A formal quotation for a fully reconditioned Model 700 Finisher, pressbench and a brand new No.18 twin bandscourer was produced by the Sales Department at the Standard office in Kettering.The quote included full machinery specifications and dimensions aswell as important power supply information. It also included leasing options, warranty lengths and payment terms.Hopefully everything the customer could possibly require to make an informed decision.In addition, at the suggestion of Keith, Standard produced a proposed shop layout plan to give Andrew a realistic idea of there furbished shop and the placing of the machinery within it.Andrew decided that he liked what he saw and within a couple of days had called Keith to confirm that he wished to go ahead and place his order with Standard After further conversations his order for the finisher, pressbench and bandscourer was rounded out with items such as racking, a heel bar last stand and a flash activator. The Sales Department then produced the necessary paperwork to move the process forward. Three documents were produced and forwarded to Andrew. The first was the “Machine Order Card” which gave the exact specifications of the machinery Standard were to build for Andrew. The second, an “Order Acknowledgment” took Andrew through the process from this point in the operation to the day the machinery was to be delivered. In this document was information pertaining to the deposit, the outstanding total to be paid upon completion of the work, precise electrical requirements and confirmation of agreed delivery date and time. The third document was the “Delivery Information” sheet. On this sheet Andrew greatly assisted the delivery process by answering a few questions about such things as parking and steps into and out of his shop. Upon the return of a signed “Machine Order Card”, “Delivery Information” sheet and deposit the order was confirmed and Standard set about building the required machinery. The agreed “Machine Order Card” was then turned into a number of Production Orders covering each of the machines to be built.As this order covered new as well as reconditioned machinery the basic operation proved to be different for each.The reconditioned 700 finisher and Press bench were completely stripped in our factory down to their constituent parts. The tinwork was then shotblast off site removing layers of paint and debris. This tinwork was then reassembled in our tin shop.The new No.18 had a different beginning in life. The tinwork was cut from new steel sheeting and assembled and welded. 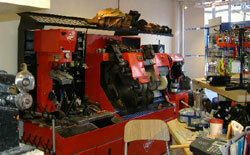 At this stage both the new and reconditioned machines were ready for a little colour! The painting process at Standard truly sets us apart from any other company when it comes to repair machinery production. Other companies can offer foreign machinery in any colour as long as it is grey, or refurbished machinery painted over the existing paintwork. 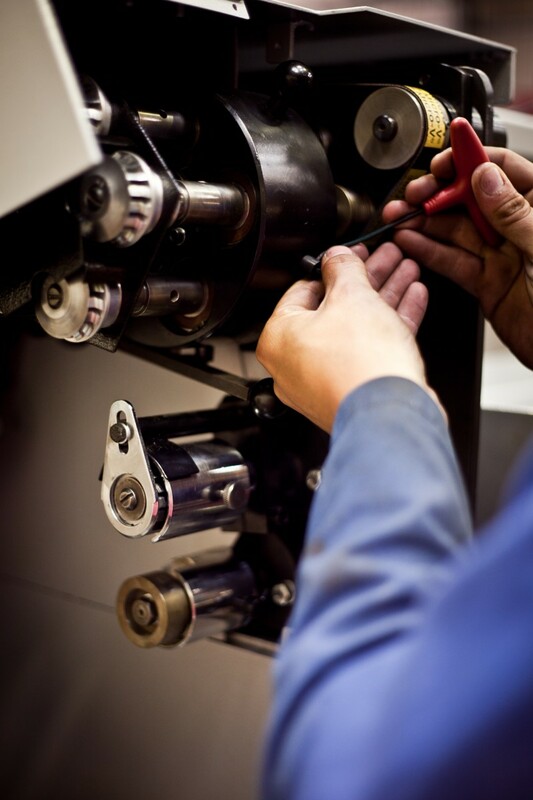 At Standard both new and reconditioned machinery begins with the bare metalwork. This bare metal is undercoated and stove dried. The main machinery colour is then sprayed on and this again is baked dry. In this instance a second colour was required. At this stage the painted areas are masked up and the second colour is applied. Again the painted tinwork is stove dried for additional durability. The major tinwork and all of the smaller parts go through the same process. In this case the colours chosen by Andrew were O4E53 Orange and HF114 Black Hammer behind the tooling. Whilst the metalwork is being painted the Stores Department were busy picking all the parts required for the machinery build. Based on the Production Orders produced earlier the storesmen assembled the motors, pullies, cutters frames, mops and brushes and all the other items required to build the machinery. Once the painted metalwork and the machinery parts are delivered to the fitting engineers the machinery finally starts to come together. The Fitters proceed to build the machinery up from the painted framework adding and testing each of the components. Motors are run-off. Pullies and contact wheels are assembled and ensured they are running true. The extraction system is constructed and tested. The cutting shafts are attached and put through their paces. The wiring is completed, tested and re-tested. The reconditioned machinery is constructed with new components and consumables – usually only the original motors are used after testing. 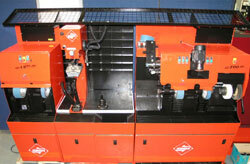 The new machinery is of course constructed with all new components and consumables. Once built to the fitting engineer’s satisfaction the machinery was then moved into the “Run-Off” area. In the “Run-Off” area each of the machines is subjected to rigorous testing by the Production Controller. Not until he is happy with the operation of any machine is it allowed to leave the building. Any item which needs attention is discussed between the Head Fitter and the Production Controller and changes are made if required. Once the machinery has been passed off fully tested the Sales Department contacted the customer to arrange the delivery. A date and time are agreed and the final invoice is prepared to cover the work undertaken. On the day before delivery the machinery was loaded aboard our Company vehicle. At the appointed time Standard’s delivery engineer armed with the details included on the previously completed “Delivery Information” successfully delivers the machinery. Andrew gives our driver a cheque to cover the outstanding balance of his order. 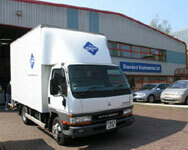 Andrew is a happy customer and Standard are a happy supplier. A few weeks later Sales Director Keith Malyon calls into the shop to make sure that everything is OK, and to make sure Standard has another satisfied customer. Andrew knows that any information, help, or parts he requires in future can be sorted by a single phone call to Standard Engineering.